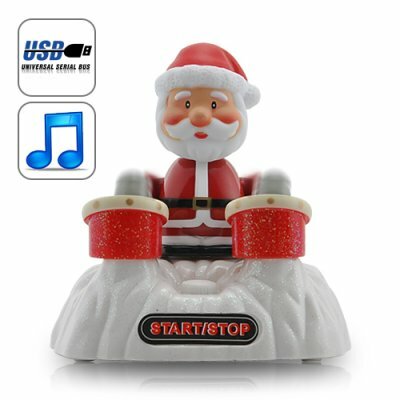 Successfully Added The LOL Santa to your Shopping Cart. He's grandfatherly cute. He drums like John Bonham meets Keith Moon. He plays four of your favorite Christmas melodies of all time. It's The LOL Santa!!! Just plug it into your USB port or stick one of those USB wall adapters on it and use wall power...and you'll be seconds away from holiday happiness for hundreds! Perfect for your home, office, or store...or give it. Nothing shows that you love and care like giving someone The LOL Santa! It's the perfect gift for your mailman, your child's busdriver, your doctor's secretary, your 108 year old librarian, your trailer-park brother in law, the guys in the mailroom, the receptionist, and much much mooore. Brought to you by the online LOL specialists and leading China electronics wholesalers - Chinavasion.